Have you ever noticed how divisive the humble tomato is? The poor thing already suffers from an identity crisis - they say it's a fruit but does anyone ever enjoy a bowl of tomatoes for dessert? Serve them over ice cream? There are so many who forgo the tomato on a sandwich (a BLT without the T?!? ), who push them aside in a salad, who have never known the bliss that is a tomato dressed with olive oil and salt. 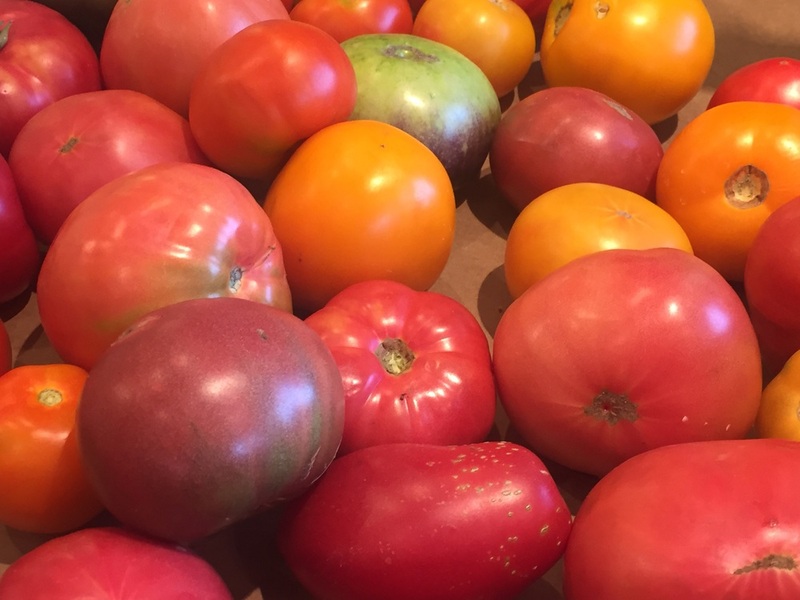 Driving through rural Pennsylvania yesterday we passed dozens of farm stands all bursting at the seams with magnificent ruby red tomatoes and it was all I could do to not insist that we pull over and fill the back of the van with a couple hundred pounds of them. I had visions of canning for the winter, of evenings of caprese salad, panzanella, tomatoes stuffed with rice salad. Then reality hit as I looked at the guy next to me who was driving our motley crew across his home state and I realized that my tomato nirvana was not to be. Alas, my husband is not a fan of tomatoes. Sure, he will eat salsa, spaghetti sauce, red pizza but God help us if a slice of tomato grace the inside of his sandwich. Pleas from me to simply remove the offending item from his panino are met with incredulity and derision as apparently this poor little tomato slice has the ability to leave traces in the form of tomato guts and seeds. Sadly it seems that this summer all of my tomato consumption will take place at lunchtime. I have grandiose plans for these beauties: panzanella, caprese, bruschetta and this year I am going to make pomodori con riso. My mouth is watering as I wax nostalgic about rice stuffed tomatoes that are a staple in Rome. You can purchase them at the prepared food stand where they also sell roasted chickens, rice balls and other such goodies that are perfect for a summer night when you don't want to cook. Stuffed tomatoes make a quick dinner (in my case lunch) and are a wonderful departure from stuffed peppers which I often times find to be too bitter. And because everything roasted tastes better with potatoes, the traditional preparation for these is to stuff potato chunks all around the tomatoes while they cook. Meatless Monday just went Roman. So now it's your turn to chime in. Tomatoes: love 'em or hate 'em? Leave a comment below. And if you are so inclined, leave a recipe. My husband won't thank you but I will! !